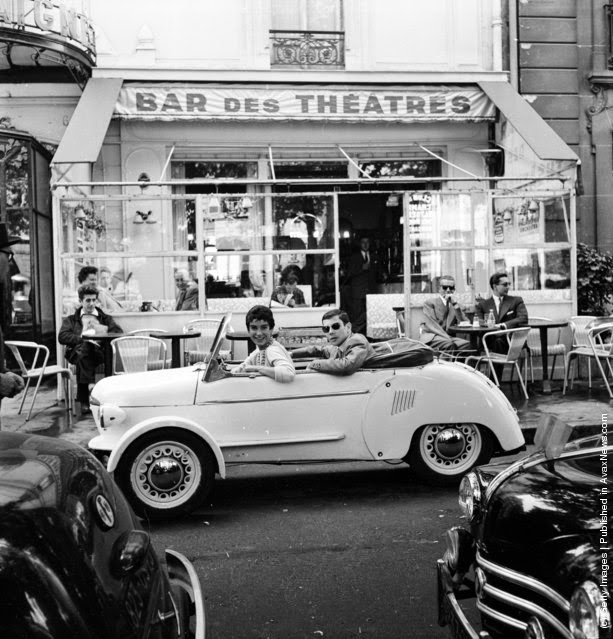 French model Suzette Clairy takes her boyfriend for a spin in a Reyonnah, a narrow runabout vehicle named after its inventor, Monsieur Hannoyer. The front wheels can be drawn in to enable the car to pass into a tight parking space, or even through a doorway. (Photo by Serge Berton/Getty Images). 1955. 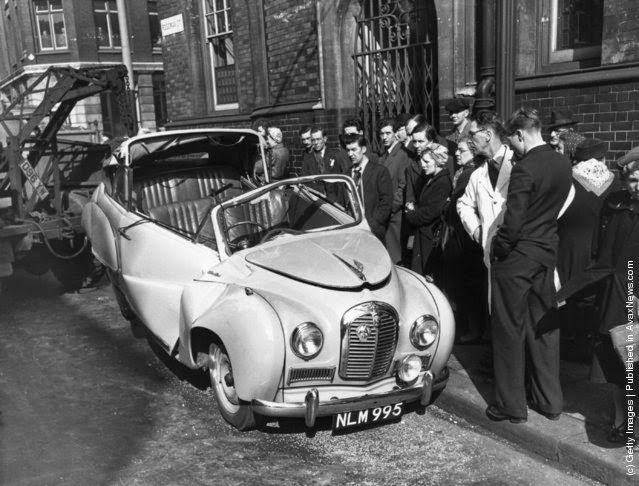 An Austin A30 is towed away after losing a traffic argument with a Foden lorry in Clerkenwell. (Photo by Monty Fresco/Topical Press Agency/Getty Images). 11th March 1954. 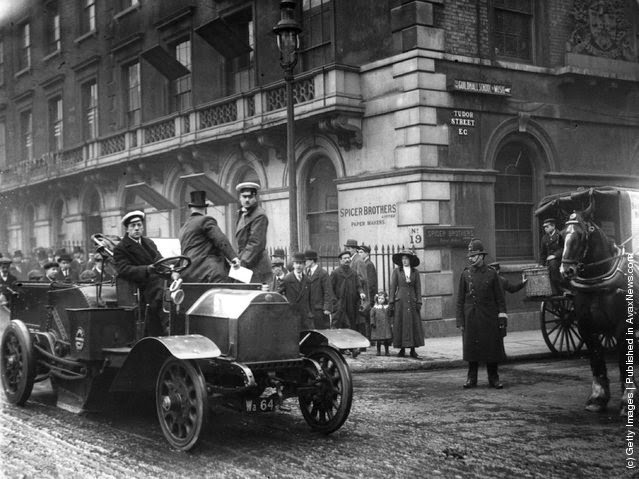 A demonstration of a vacuum cleaner for the London streets, with representatives of the London Corporation in the car. (Photo by Hulton Archive/Getty Images). 9th April 1913. 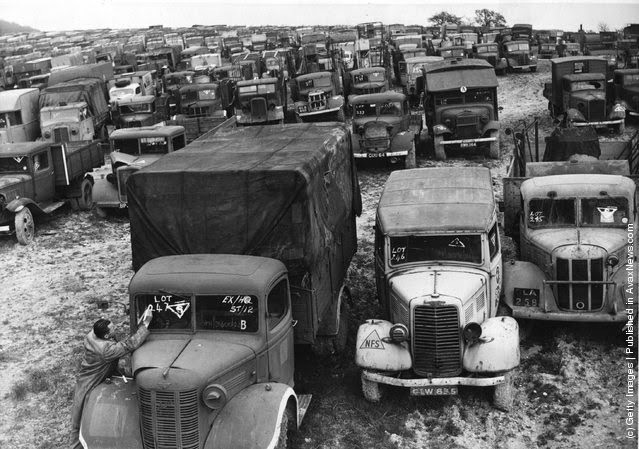 A man marks lot numbers on lorries for the car auction sale at Great Missenden, Bucks, at which thousands of cars and lorries will be offered for sale in the biggest car auction sale ever held in Britain. (Photo by Fox Photos/Getty Images). 24th April 1946. 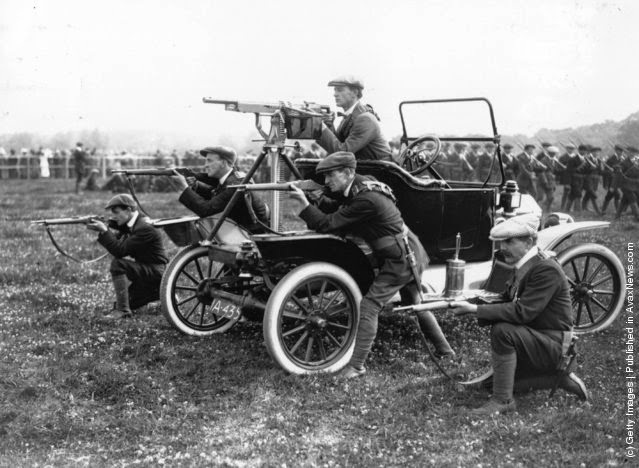 Ulster volunteers, the Ulster Unionist paramilitary force, in training. (Photo by Central Press/Getty Images). 1914. 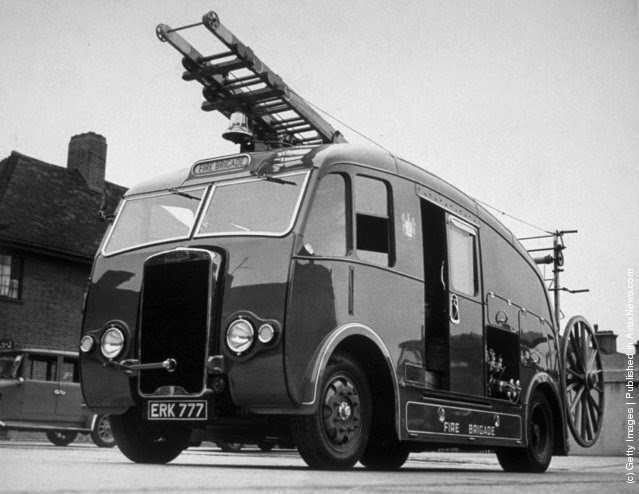 The latest streamlined fire engine, supplied to Croydon Fire Brigade. (Photo by Central Press/Getty Images). 1940. 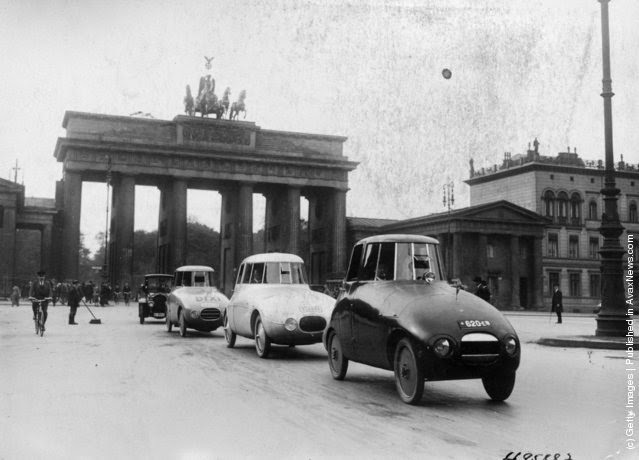 A pioneering experimental streamlined car with bodywork designed by Hungarian-born German aerodynamicist Paul Jaray being driven around the streets of Berlin for the first time, circa 1935 (the Brandenburg Gate is in the background). (Photo by Keystone/Getty Images). 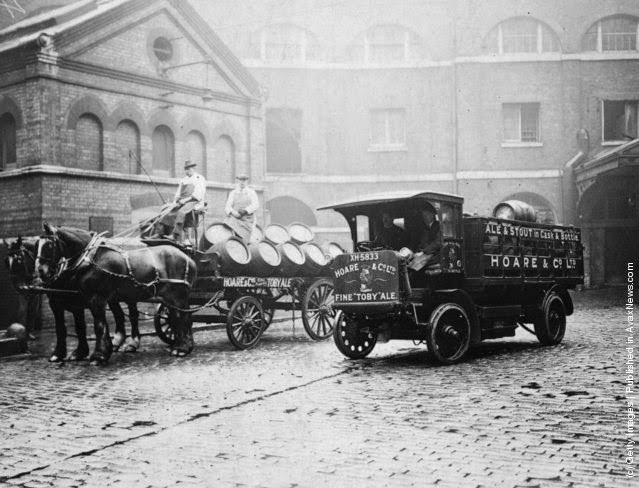 A horse-drawn cart and an electric lorry at Hoare and Co's Brewery. (Photo by Topical Press Agency/Getty Images). January 1922. 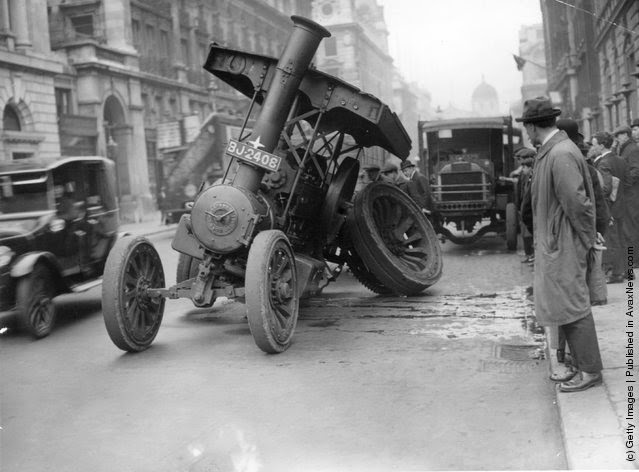 A steam traction engine with a broken rear axle in Pall Mall, London. (Photo by Topical Press Agency/Getty Images). November 1923. 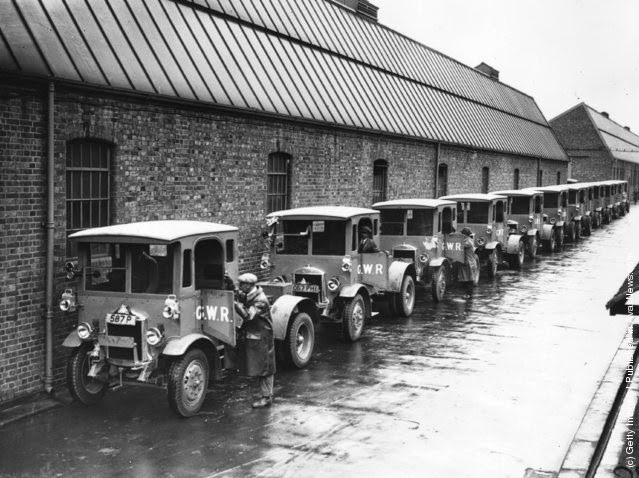 Some of the 219 new lorries ordered by Great Western Railways, built by Dennis Bros at their Guildford works. (Photo by J. Gaiger/Topical Press Agency/Getty Images). 31st May 1931. 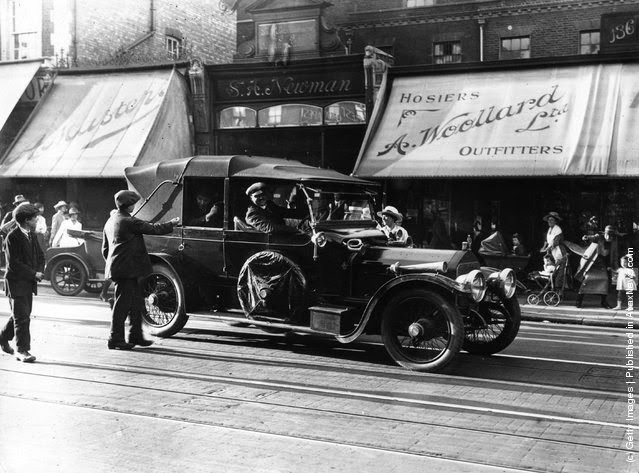 British-born comic actor and director Charles Spencer Chaplin (1889–1977), driving through a London street. (Photo by W. G. Phillips/Topical Press Agency/Getty Images). October 1921.